Sardinian knotted embroidery, known as Punt 'e Nù, comes from the town of Teulada in the south of Sardinia. It features designs made from small knots worked on the surface of the fabric. 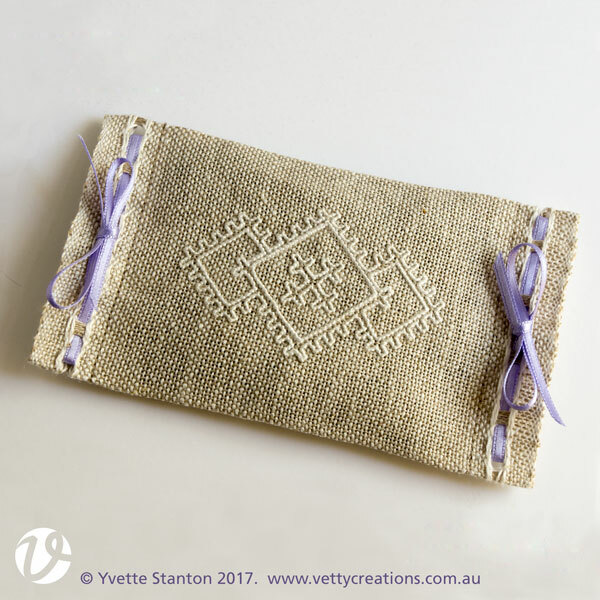 This project has been designed specifically for beginners to learn how to do Sardinian knotted embroidery. The stitch used for Sardinian knotted embroidery is quite simple. The difficult part is putting the knots in the right place. This project uses linen with natural coloured threads for the weft, and white threads for the warp, which makes it easier to choose the correct place to insert the needle. Lavender is a natural deterrent for moths, so a lavender sachet in with woollens helps to protect them. Lavender's lovely aroma is also perfect for slipping into underwear drawers. This project makes a great gift: beautiful, aromatic, and useful. The kit features detailed step-by-step instructions, with accompanying diagrams. They are written specifically for beginners to the technique. Some counted embroidery experience is recommended. This kit will debut at the 2017 Sydney Craft and Quilt Fair. Kits ordered here will not be posted until the end of the fair - after 25th June. Worked on 28 count linen banding, with pearl cotton.